Construction crews are busy all along Quarterpath Rd in Williamsburg VA.
Royal Dominion Homes is now building Town -homes at Village at Quarterpath within the city limits of Williamsburg at prices starting from $209,000. 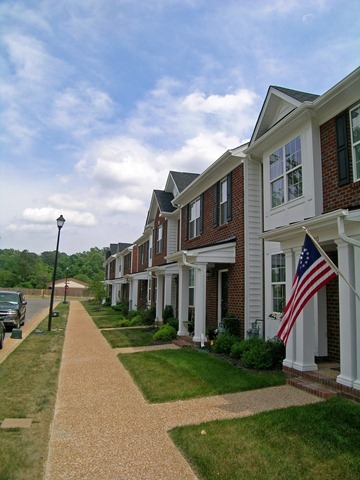 The current HOA Homeowner Association Fees at The Village at Quarterpath are $ 85.00 monthly for town homes. 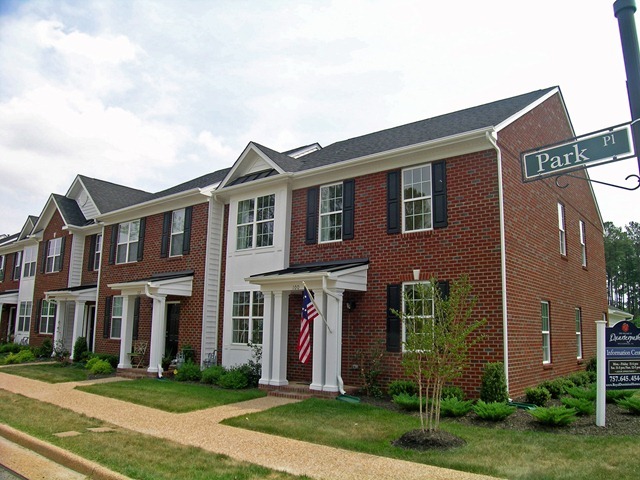 This includes exterior lawn maintenance, common area maintenance and a scheduled roof replacement for the town homes. New Floor Plans!!!! New Lots!!!! 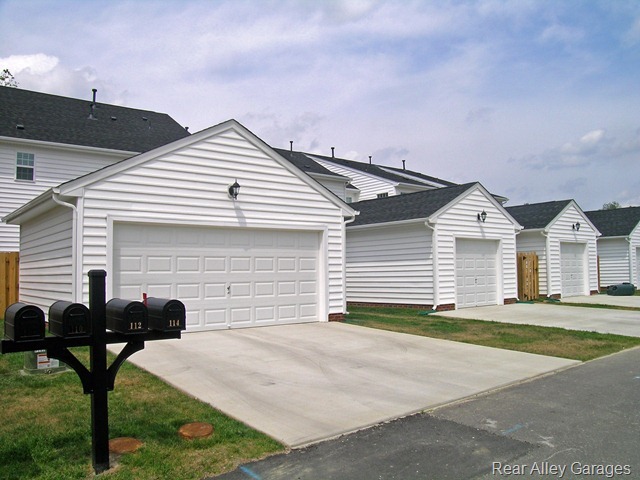 Two new floor plans are now available at Village at Quarterpath.. These will be built on the eight duplex lots overlooking the Village Green. The first is the Chesapeake- an outstanding new 1st floor master suite that features a family room with a cathedral ceiling and a second floor loft overlooking the family room. The Chesapeake also features an optional 2nd floor master suite with a luxury bath. The York Grande has the same popular features as our York floor plan, only bigger. This plan’s footprint is 4 feet wider than our traditional York and boasts an enormous family room (16 x 25) and master bedroom suite (15 x 25). Total square footage comes in at 2,243- an incredible value starting at $239,990!! The York Model at the Village at Quarterpath in Williamsburg, VA. At approximately 1,940 sq feet, this open design has a huge family room at 21 x 15 and master bedroom at 21 x 15 and includes a one car garage. 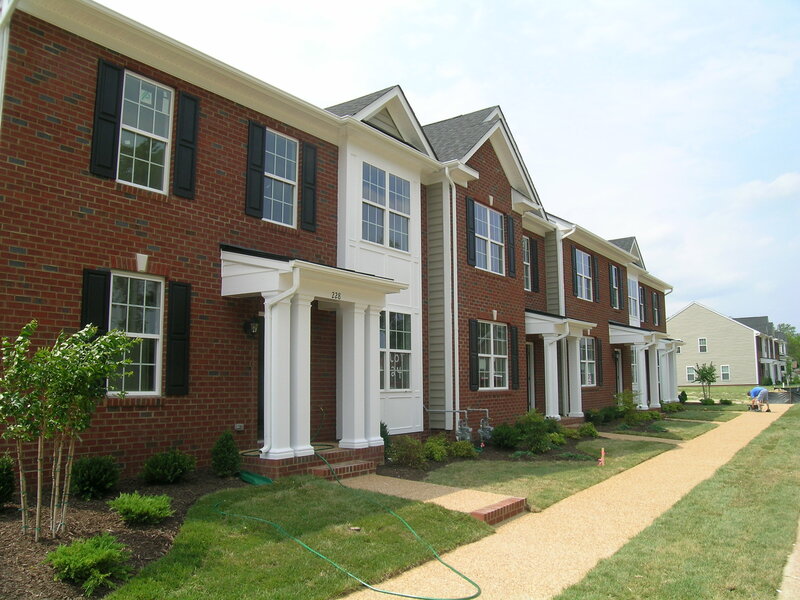 Starting at $209,000, this limited time pricing is the best value in quality, custom homebuilding in Williamsburg. The Madison Model : Move home and enjoy this amazing open, two level townhome featuring two or three bedrooms with two and half bathrooms. This versatile floor-plan features an oversized 18 x 20 living room that flows into a large 12 x 24 kitchens with a breakfast nook and island . Great for entertaining and meal time. Need more space. Add a sunroom or family room optional extensions to bolster the square footage to 1936, providing the second floor with some great options for the master bedroom. Upstairs, relax in an owner’s suite with a soaring cathedral ceiling complemented by the large walk in closet. A luxury owner’s bath and sitting room create an inspiring retreat useful at the end of any long day. The second floor also boasts two spacious bedrooms and a full bath, along with a convenient second floor laundry room. Add extra storage space by adding an optional 8 x 20 attic. Exit the rear entry and discover either an optional 1 or 2 car detached garage providing additional storage and shelter creating a backyard retreat. Walk upstairs and find space to choose from several different bedroom arrangements, designed to accommodate a multitude of needs. For those desiring a second floor master bedroom simply select the option for our large, dual walk in closets and a second luxury bath bedroom design. Exiting the rear entry, the space continues with a 1 or 2 car detached garage providing not only more storage but an auto shelter and a backyard for the perfect finish! The Jefferson Model :Spacious Living awaits in this two level townhome with up to four bedrooms and three and a half bathrooms! A front, covered porch greets family and visitors alike and delivers them into a beautiful open foyer and an incredible 2460 square feet of living space. The natural and open combination of the dining and kitchen area creates a fabulous flow, meant for memorable entertaining. Relaxation exudes from the first floor master bedroom, highlighted by a large walk-in closet and two-room master bath. 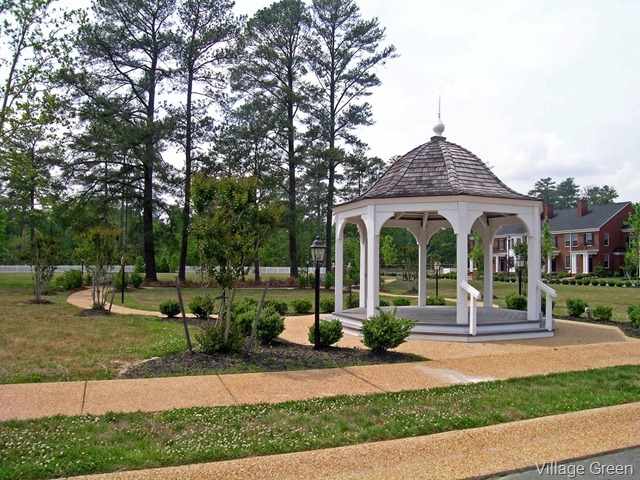 The Village at Quarterpath is sited on Williamsburg’s Quarterpath Road among some of the historic city’s most notable features: the Colonial Golf Club, the Colonial Williamsburg Foundation Nursery, Quarterpath Park, and a series of historical markers that are several centuries old. It is the goal of the developer of this newly planned residential area to maintain the site’s historic character while designing the best home sites the parcel would allow. 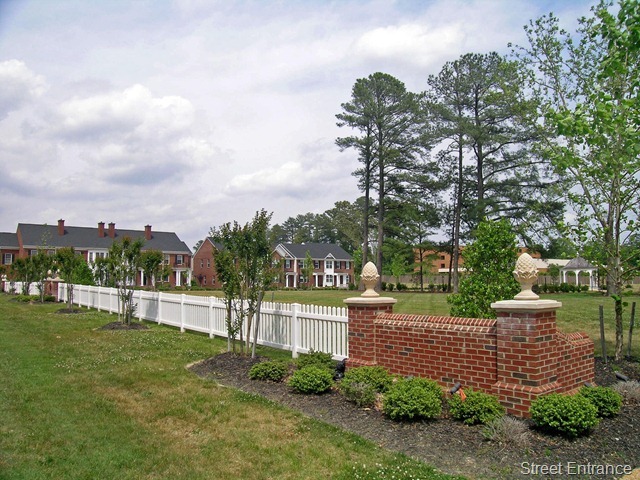 Village at Quarterpath is located within the city limit of Williamsburg and enjoys the lower tax rate of the city ( .54 per $100 ) as well as other benefits. It is located across the street from the Quarterpath Recreation center a 23-acre facility that includes three lighted softball fields; a 25-meter, 6- lane-Z-shaped outdoor swimming pool, Swimmers with a need for aquatic speed can shoot through two sliding tubes into 12-foot water. Kiddies have a pool all to themselves. Three all-weather tennis courts; playground equipment; and a picnic shelter complete the amenities. Quarterpath Park is also the site of the Quarterpath Recreation Center, a 35,000 square foot facility that offers an 18,000 sq. ft. double gymnasium, a 1,700 sq. ft. dance/aerobics room, two classrooms and a 1,900 sq. ft. multipurpose room. Various instructional classes, athletic programs for youth and adults, sports camps, and special events are held throughout the year at this facility. This beautiful, wooded 22-acre park preserves and interprets two of the fourteen Civil War earthworks forts – or redoubts – which made up the Confederate’s Williamsburg Line in the Battle of Williamsburg. This engagement on May 5, 1862, resulted in more than 3800 Union and Confederate casualties and left the Union in control of the Virginia Peninsula. This inconclusive engagement left the Union in control of the Virginia Peninsula. These fortifications remain a stark tribute to those who served, defining America’s future. The service-oriented shopping center opened in November 2009 — with “everything a neighborhood needs to support its daily lifestyle,”. The list of expected tenants includes at least two restaurants, a salon and a dry cleaner, among others. The developer is in discussions with several national restaurant chains at this time. TowneBank and Wachovia will open branches in two of four outbuildings. Quarterpath Crossing’s location is across Route 199 from the main entrance to Kingsmill on the James. Another nearby project will be Quarterpath at Williamsburg —Riverside Health System plans to build a 120-bed nursing home at Quarterpath at Williamsburg, a 350-acre mixed-use development at the intersection of state Route 199 and U.S. 60. Plans for the project include 1,374 dwellings (including single-family homes, town houses and condos) 200,000 square feet of medical office space, 202,000 square feet of offices space and 400,000 square of “destination” retail use. Riverside has now received state approval to build Doctors Hospital of Williamsburg, a 40-bed hospital . The new street through Quarterpath Crossing will wind through the woods past a nursing home, assisted living, medical office park and retail and residential areas. The street will connect with Route 60 near the 7-Eleven. The residential neighborhood will feature a second street running from Battery Boulevard back to Quarterpath Road, intersecting just below the redoubts near Route 60. Riverside had been trying for about eight years to get into the hospital business in the Williamsburg area, and twice its application to build a new hospital has been denied. Construction will start once the necessary city approvals are in place. Construction of the newly approved hospital won’t begin until 2010. The two-story hospital will be designed to accommodate expansion in case it’s needed in the future. The hospital includes an intensive-care unit and two operating rooms. Road construction off Pocahontas Trail marks the beginning of Doctors Hospital. It also illustrates how the recession has changed the shape of Riverside’s mixed-use development. Clearing has begun for Battery Blvd. which will eventually intersect Quarterpath Road. They are building the road to the first intersection, which will be Commonwealth Avenue. .As a result of a slow housing market, the hospital will be built first. An accompanying nursing home has now been scrapped. Initially the hospital was situated at the center of the planned development, closer to Quarterpath Road. It has now been moved toward the front of the site [Pocahontas] so they can build less infrastructure to reach the hospital. The preliminary plat calls for 1,374 residences .Those units include 95 single- family homes, 397 “senior adult attached dwellings” and 882 condos and townhouses. Plans for 202,000 square feet of offices and 400,000 square feet for a shopping center remain dormant. The nursing home has been scrapped next to Doctors Hospital of Williamsburg. Bill Downey, executive vice president of Riverside Health System, blamed the recession. “We’ve seen a decline in use rates of nursing homes,” he said this week. Just last month, City Council sweetened the pot for Riverside by easing infrastructure requirements and granting a break on all city taxes except real estate for the medical components. Tracey Dowling, administrative director for real estate services, said Riverside has obtained a permit from VDOT for the hospital access road to enter where the old Whiting Funeral Home was located on Pocahontas Trail.The hope is to get remaining permits approved by this summer to begin work on the road by the fall, in time for groundbreaking. Civil War enthusiasts have complained that the mixed-use and medical campus will destroy remnants of the site of the 1862 Battle of Williamsburg. Last week the battlefield was declared “at-risk” by the Civil War Preservation Trust. Diana LoVecchio, Riverside’s vice president of construction management and shared services, said she hopes to have construction on the hospital under way in early 2011. Downey doesn’t think the recession has diminished the need for a second hospital. She acknowledged that the growth once projected in greater Williamsburg has cooled with the recession but asserted that a second hospital is still viable. “Population growth has slowed, but everything we’re seeing in Williamsburg, James City and upper York County is that it will continue to grow even if it’s at a slower rate,” he said.